Now more than ever, we must redouble our efforts to both fight climate change and protect our oceans. Given the urgency of the climate crisis, the Natural Resources Defense Council is working hard to advocate for all forms of clean renewable energy projects, including the nascent offshore wind industry. This agreement deepens our conviction that we can move forward with both goals – growing clean offshore wind power while protecting the endangered right whale. The standards agreed to by Vineyard Wind set the bar by which other offshore wind developers will be measured. 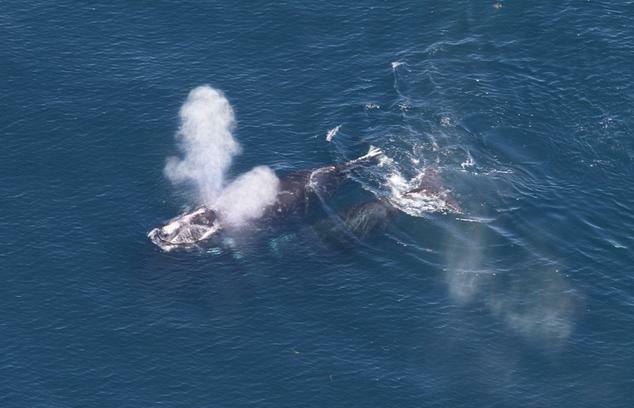 North Atlantic right whales are fighting for survival, with a dwindling population and small number of breeding females. Their decline is due largely to entanglement in fishing gear and collisions with ships, but without protections from all additional stressors the species may not recover. As part of this agreement, Vineyard Wind’s project plan adopts restrictions, beyond those required by law, on vessel speed and limits loud turbine construction from pile driving and geophysical survey activities to times when North Atlantic right whales are unlikely to be in the area. Noise pollution can mask whales’ important underwater communication calls and reduce foraging success, which affects species’ health and reproductive abilities. Ocean noise can also divert the whales from their typical migration paths into areas unsuitable for feeding or into the path of passing ships. Underwater noise reduction measures to limit potentially disruptive sound emitted during construction. Vineyard Wind, based in New Bedford, Massachusetts, will also invest $3 million to develop and deploy innovative technologies and undertake scientific research to further safeguard marine mammals from a range of ocean impacts, such as incidental entanglement in fishing gear. The agreement was co-signed by NRDC, the National Wildlife Federation, and the Conservation Law Foundation, and was sent to the Bureau of Ocean Energy Management. The U.S. lags behind the rest of the world in harnessing its offshore wind resources, but fortunately interest is now booming and the industry is finally poised to take-off. Many East Coast states have adopted ambitious offshore wind goals with the support of a broad coalition that includes organized labor, business groups, and the environmental community. Some dozen large offshore wind projects are now in the planning stages and could be built off the east coast by 2027, potentially providing enough clean renewable electricity to power around 5 million homes. Planning for offshore wind has begun on the west coast as well, where deeper waters will require the use of new ‘floating’ technologies. This is all exciting news as speed truly is of the essence when it comes to transitioning our society to cleaner, greener fuels. NRDC’s groundbreaking analysis, America’s Clean Energy Frontier, shows that in order to meet our U.S. climate goals we need to scale up U.S. offshore wind power, together with other forms of renewable and clean energy. It is also vitally important to ensure that offshore wind projects are sited and built in a way that protects our oceans and ecosystems. The recent Intergovernmental Panel on Climate Change (IPCC) report describes—in stark terms—the consequences for both humans and ecosystems if we fail. Continued warming of our oceans stands to trigger massive disruptions of up to 70 percent of marine life on a scale not seen in the last three million years. Of course, as we continue on this faster track, we need to ensure that offshore wind projects avoid potential conflict with endangered species that could slow their recovery. Today’s agreement serves as a model to ensure that offshore wind projects don’t harm these magnificent creatures and cause resulting delays for the offshore wind industry. We look forward to future opportunities for proactive collaboration on strong yet achievable ocean and wildlife protections with offshore wind industry leaders, as well as helping the offshore wind industry secure stable, long-term support from states and the federal government that will reduce costs and bring U.S. offshore wind to scale.